This doll is always ready for playtime; that is if playtime includes a murderous rampage! It’s all Child’s Play until someone gets hurt - and this guy wants to make sure of that.From his head that spins all the way around to his arsenal of scary weapons, Chucky is always on the ready for making someone’s night a living nightmare - let’s hope you don’t run into him this Halloween! From menacing moms everywhere to making friends with children for his own benefit, Chucky is an iconic bad guy character from one of the scariest movie franchises of all-time. While his character is something nightmares are made of, he’s also one of the most memorable characters. His terrifying disposition and penchant for murder make him the perfect choice for a Halloween costume. 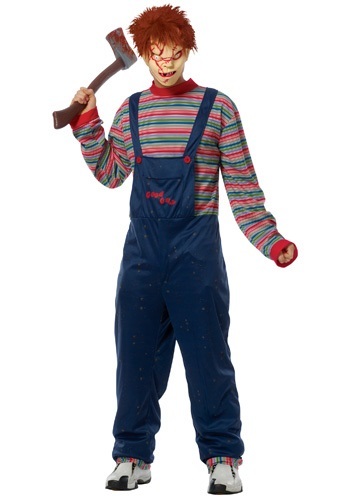 This Adult Chucky Costume comes with everything you need to recreate the iconic look for Chucky from the Child’s Play movies. This officially licensed costume comes with a 100% polyester stretch knit jumpsuit that has the shirt sewn to the waist. The multi-colored striped shirt has a Velcro enclosure on the back for a secure fit. The blue overalls have the ‘Good Guys’ logo printed on the chest pocket. Though we all know Chucky is anything but a good guy. 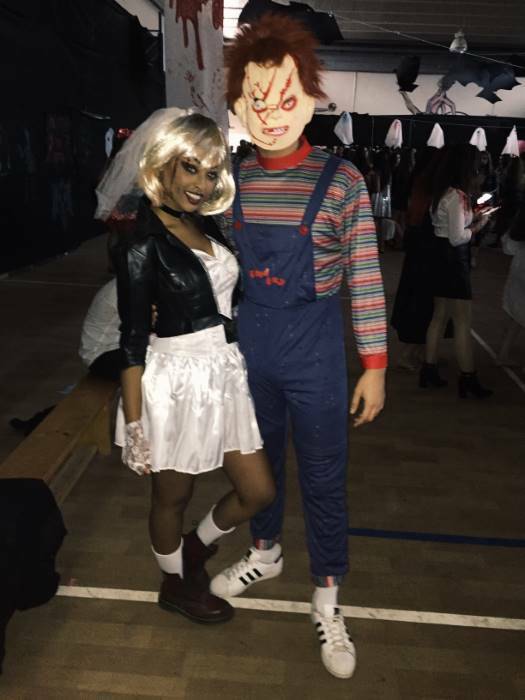 The look wouldn’t be complete without the included soft foam ½ Chucky mask that has attached fake hair and secures with an elastic band. Pick up a toy axe or toy knife accessory to really look menacing this Halloween! Looking very good! Thank you for your service your doing a great job, my costume arrive at the right time with no problem!